All native Australian palms have an edible heart, sometimes called palm cabbage. Palm heart is the inner cylindrical shaped portion of the palm running from the terminal bud down about maybe 1/8 the length of the trunk, until it becomes fibrous. Basically it’s the inner trunk at the top of the tree. The terminal bud is the point at which the palm fronds emanate from. Palm cabbage or heart can be eaten raw or cooked. Some palm heart I’ve had tasted ridiculously bitter, with a slight vegetable flavour. Others have been sweet and juicy with a pleasant crispy texture. I’m not sure how to determine whether the cabbage will be bitter or sweet without actually tasting it. I suppose certain species may be sweeter than others. I’ve found the more arid the location, the more bitter the palm heart. Harvesting the palm heart or cabbage kills the tree. 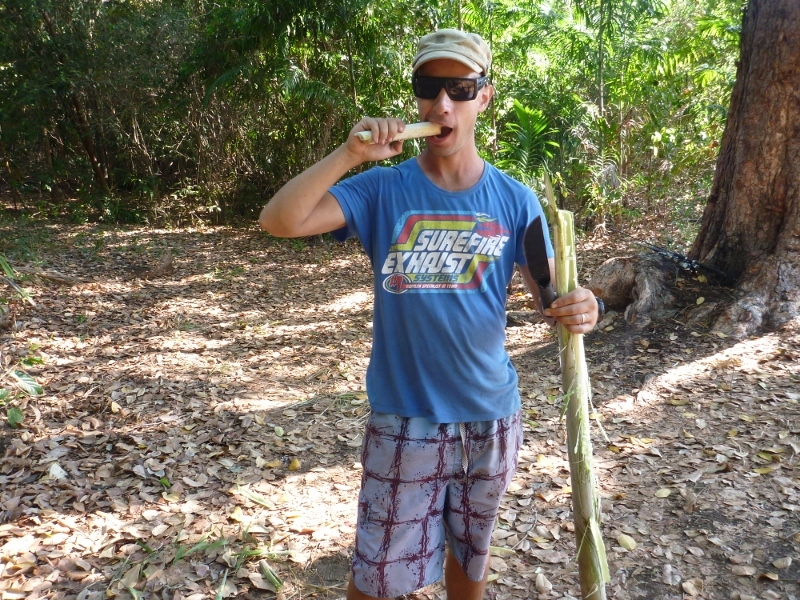 Palm heart would pose an ideal survival food in palm rich areas of Australia, provided you have a machete or similar cutting tool.